My first visit to this pier took place on a sultry summer night in the mid-1970s. 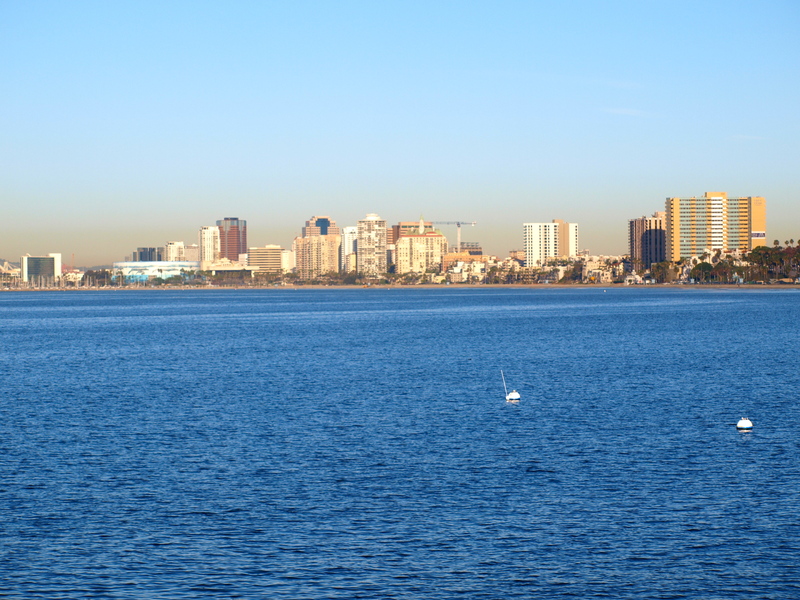 I was visiting southern California with my family, shepherding my wife and kids to the “must see” tourist spots during the day, and making short excursions to the local piers during the morning and evening hours. 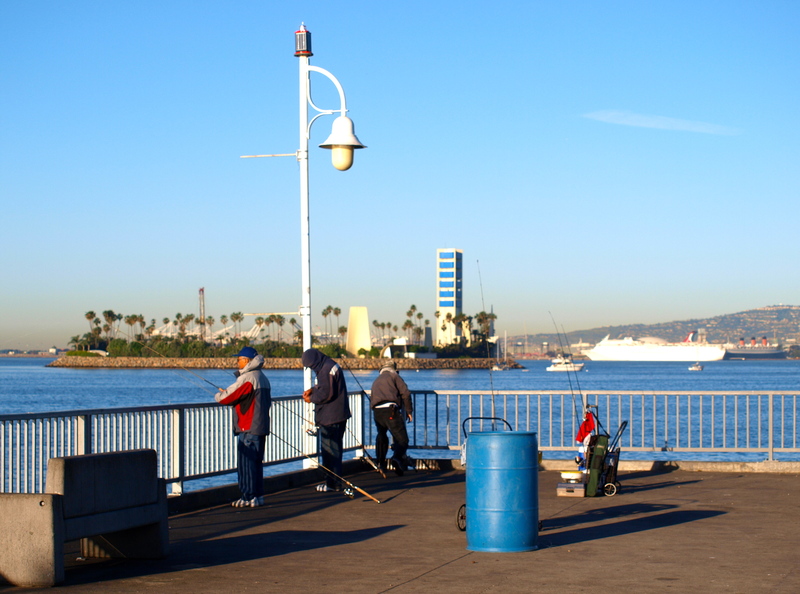 Much to my surprise, anglers at this pier were using drop-lights to fish. These lights consisted of a heavy electrical cord with a plug at one end and a light with a reflector at the other end. Fishermen would plug their lights into the electrical outlets located on the pier’s overhead lights. They would then lower their cords and lights down so that the drop-lights were just above the surface of the water. Inevitably, small fish such as anchovies and smelt were attracted to the lights and would swarm near the top of the water. Every so often a larger fish would approach, the small fish would scatter and disappear, and then, a few moments later, fish would reappear. Anglers, using light lines and small baits, were catching their share of the larger fish. One couple allowed me to share their light and I quickly caught a small sand bass followed by several tomcod (white croaker) and mid-sized herring (queenfish). I didn’t have a drop-light but vowed that when I returned, I would bring one with me. Unfortunately, I waited too long, the electrical outlets were removed in the ’80s (due, the authorities said, to the fact that the outlets encouraged all-night camping and fires, which the campers set to keep warm). 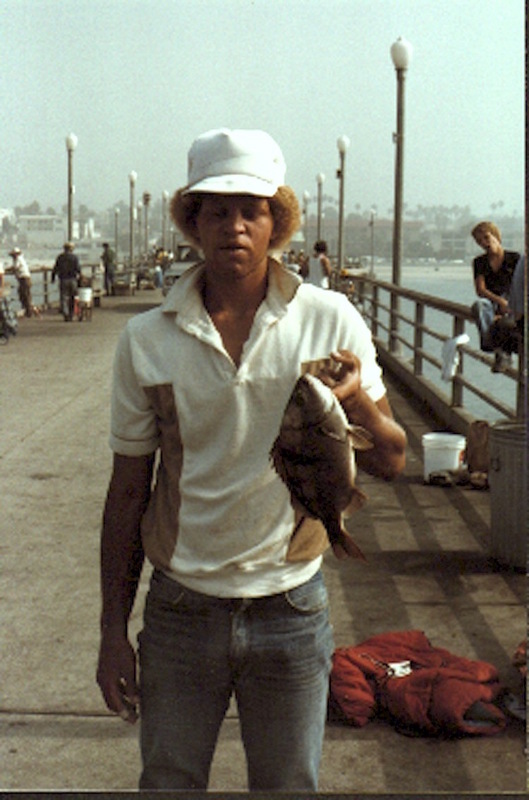 Nevertheless, even without drop-lights, I’ve generally caught some type of fish whenever I’ve visited the pier. 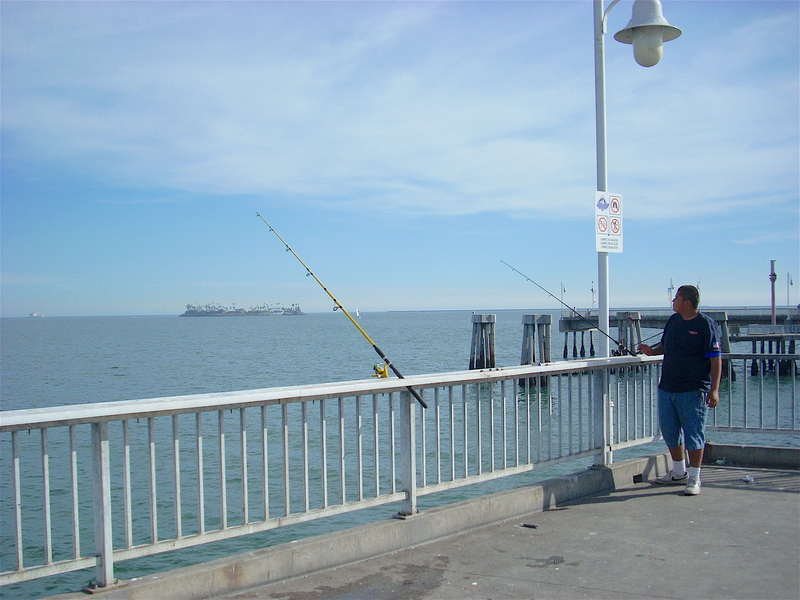 The pier receives heavy use from anglers and, with the exception or “red tide” occurrences, almost always yields some fish. Environment. 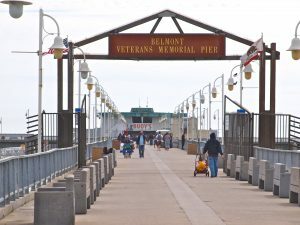 The 1,620-foot-long, T-shaped pier sits on a wide, sandy stretch of the Long Beach City Beach known as Belmont Shore (called “Horny Corners” by locals and no, I don’t know why). 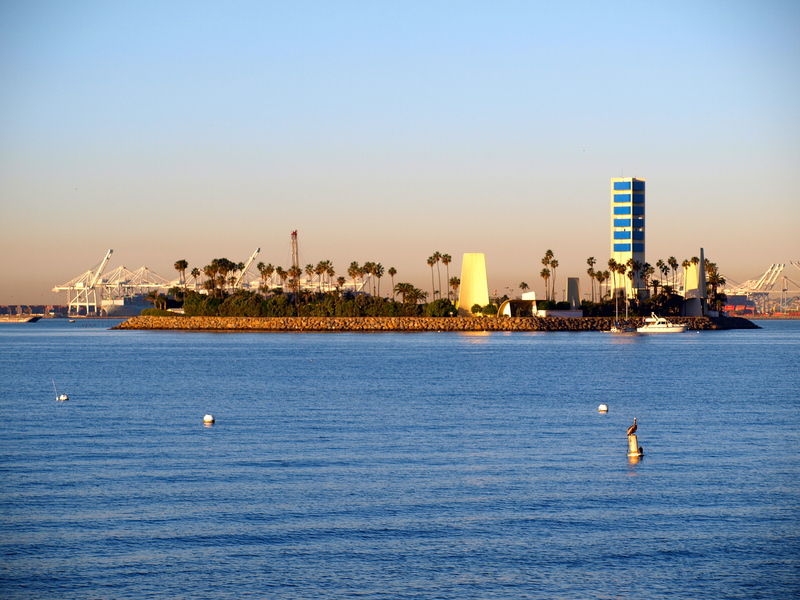 Given protection by the Long Beach-San Pedro breakwaters, this inner flank of Alamitos Bay typically sees calm waters with moderate surf. Further out and around the end of the pier the bottom is sand and mud. This area usually shows little growth of seaweed or kelp, but does have a fairly heavy growth of mussels on the pilings. 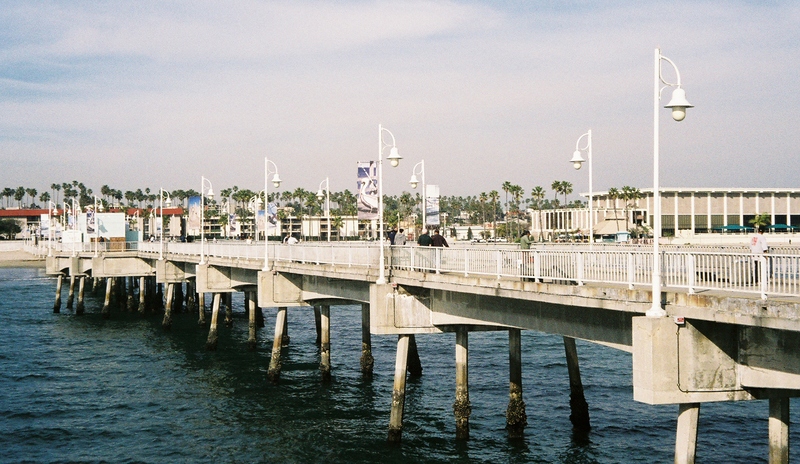 In addition, concrete rubble was placed among the pilings during the construction of the pier (in 1967) to act as an artificial reef. A negative aspect of the pier is fairly common red tide conditions (when fish will be virtually absent); at least a third of my visits in the past couple of decades have seen the pier surrounded, or nearly surrounded, by red tide. 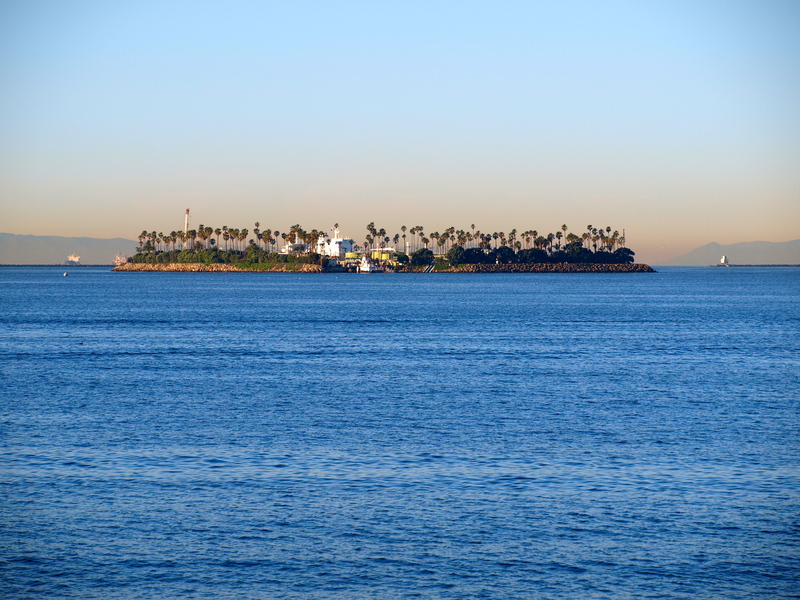 An interesting visual is the group of “Astronaut Islands” that sit a short distance offshore from the pier. Island Chaffee, Island Grissom, Island White and Island Freeman (named for the four astronauts who lost their lives on Apollo I) are artificial islands containing oil-drilling equipment. The islands were designed and decorated to appear as resort destinations and are sheathed in pastel-colored, modernistic-style walls that cloak their industrial activity. They are illuminated and landscaped with miniature plants that attempt to create an illusion of being further out to sea. Society wants the oil but doesn’t want to see the activity that produces it. The Fish and Fishing Tips. 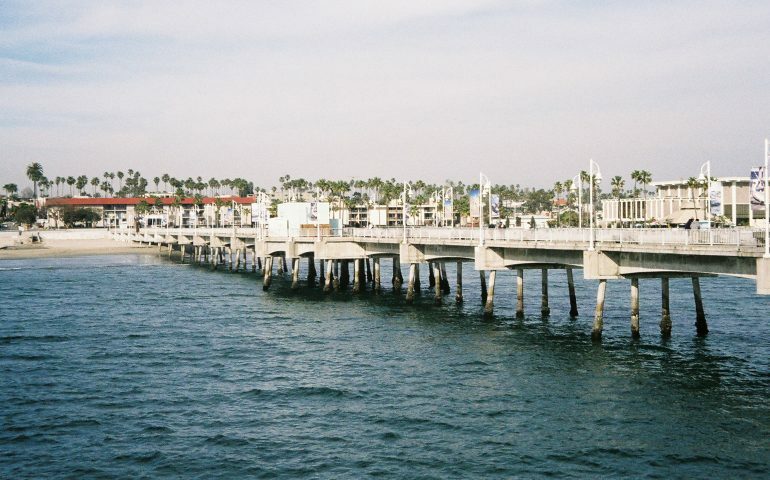 The pier has above-average surf fishing yielding corbina, spotfin croaker, yellowfin croaker, barred surfperch, round stingray, thornback rays and guitarfish (shovelnose sharks). 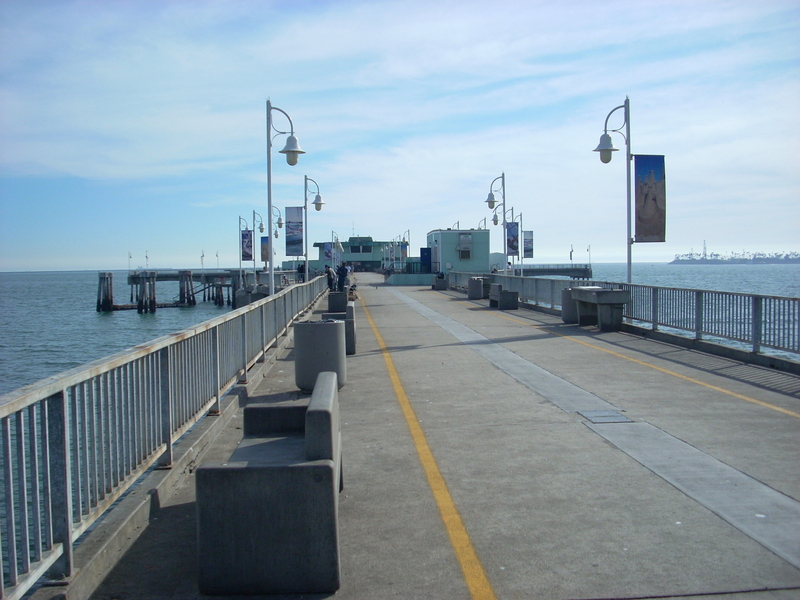 Midway out on the concrete pier is the best area for halibut and sand bass, as well as the smaller walleye surfperch, jacksmelt, tom cod (white croaker) and diamond turbot (some years sees fairly good runs of the small flatfish, especially in February or March). This mid-pier area will also yield good numbers of croakers but not in the numbers of the inshore area. The areas near the bait shop and the boat landing seem best for sargo and herring (queenfish). The wide end area itself best for the pelagics such as sardines, Pacific mackerel, jack mackerel and bonito (some years). Most of the sharks I’ve seen also seem to come from the end. Try the inshore, surf area for the larger croakers—spotfins, yellowfins and corbina—with the early morning, and early evening hours (into the dark), generally being considered the prime hours. And though I’m unaware of any stats to back it up, I personally think Belmont may be one of the best piers in the state for corbina (and I have seen as many as thirty corbina caught in just a few hours of early morning angling—by eight anglers) As for bait, corbina especially love sand crabs but fresh mussels, ghost shrimp, and bloodworms can pull in a variety of the croakers. Although anglers will debate the topic of “best rigs to use” endlessly, it generally comes down to a high/low rigging or Carolina-rigging with most of the regulars seemingly using a high/low rig. The next choice is type of hook with some using size 4-2 baitholder hooks (with sand crabs or bloodworms), or size 2-1/0 Kahle hooks (covered with fresh mussels or ghost shrimp). The choice of hook largely depends upon the type of bait you are using and the fish you are seeking. 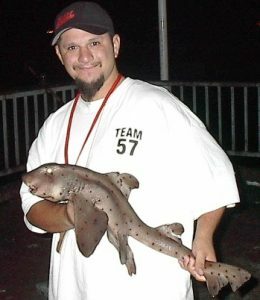 The inshore area out to mid-pier, especially at night will also yield up quite a few round stingrays, thornbacks, and shovelnose sharks (guitarfish) with an occasional smoothhound joining in the fun. Squid, anchovies, and cut mackerel seem best for the sharays. This area can also see “large” fish cruising around under the pier, seemingly at ease with the world, and impervious to whatever baits are thrown their way. They’re often mistaken for white seabass or small yellowtail but in most cases are striped mullet (that can be very hard to catch). Fish the mid-pier area using a Sabiki/Lucky Lura-type bait rig for jacksmelt, topsmelt, walleye surfperch or queenfish. If you catch a small queenfish, or even a smelt or small mackerel, remember that they make excellent halibut baits. Put the small fish on a live bait leader, sit back, and watch your pole for the light mouthings of the toothy halibut. Pay attention and be ready. The top spot for the halibut seems to be around the black asphalt section near the middle of the pier. Also remember to check the local papers for the times of the grunion runs. Halibut follow the little fish into the shallow waters by the pier. 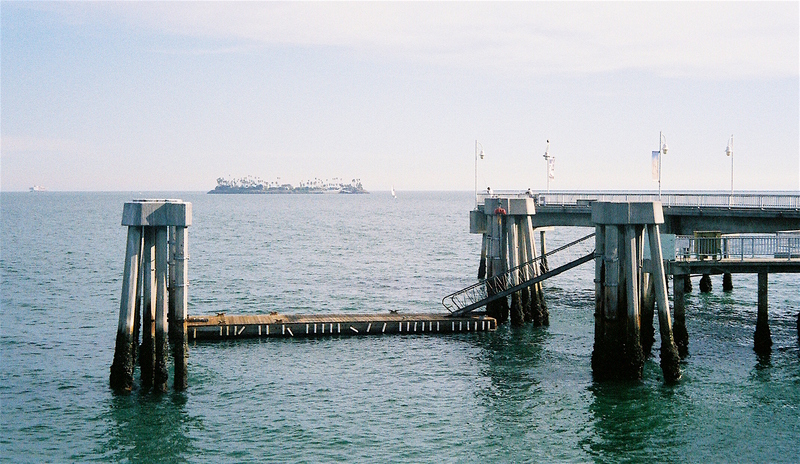 About three quarters of the way out on the pier, on the left side, is a docking area for boats. This, I am told, is one of the best spots for calico bass (kelp bass) and perch, while the end section itself yields up all three varieties of bass—sand bass, spotted sand bass and kelp bass. The far right corner of the end is supposed to be the best spot for sand bass. Most of the bass hit on cut anchovies or squid but some, especially the spotties, will hit on artificials with plastics generally the lure of choice. Anglers fishing down around the mussel-covered pilings with mussels (surprise) are sometimes rewarded with good-sized buttermouth perch (blackperch), rubberlip perch, or forktails (pileperch). Some years also see good runs of sargo (generally May to July). The scrappy grunts, up to about three pounds in weight, love fresh mussels, get positively giddy over live ghost shrimp, and seem to hit best on the bottom near the pilings in the early evening or night hours. Fish the outer wings of the pier for pelagics such as bonito and mackerel, barracuda and sharks. Use live anchovies when they’re available (generally in the summer months) for the macs, the boneheads and the pencils. Unfortunately, most months see a lack of live anchovies. Plan #2! For the mackerel, fish with strips of squid or pieces of mackerel under a splitshot sinker. Bonito splashers will work for the bonito, as will feathers trailing behind a cast-a-bubble. Spoons, gold colored, when cast at night, may yield a few barracuda during the summer to fall months. 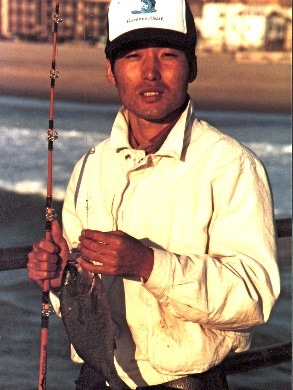 For the larger sharks, jig up some live bait (especially Pacific mackerel or jack mackerel) and then fish them on live bait, sliding leaders. Most of the sharks will be gray sharks (gray smoothhounds), shovelnose sharks (shovelnose guitarfish), leopards (leopard sharks), or pinback sharks (spiny dogfish) but occasionally there will be the larger threshers mixed into the action (a 65-pounder in November 1999, a 70-pounder in September 2001, and a 50-pounder in July of 2002). Less common will be blue sharks and sometimes even a bonito shark (mako shark)—a five-foot-long mako being landed in May of ’98. About once every thirty years you’ll also hear of someone latching onto a hammerhead shark and once every sexcentenary or so an intrepid angler may hook a white “man-eater” shark (why do they only eat men? ); most of the latter are still missing in action. If you’re satisfied with the smaller sharks, cut mackerel and squid fished on the bottom will yield small smoothies (gray smoothhounds), thornback rays, bat rays and an occasional skate. 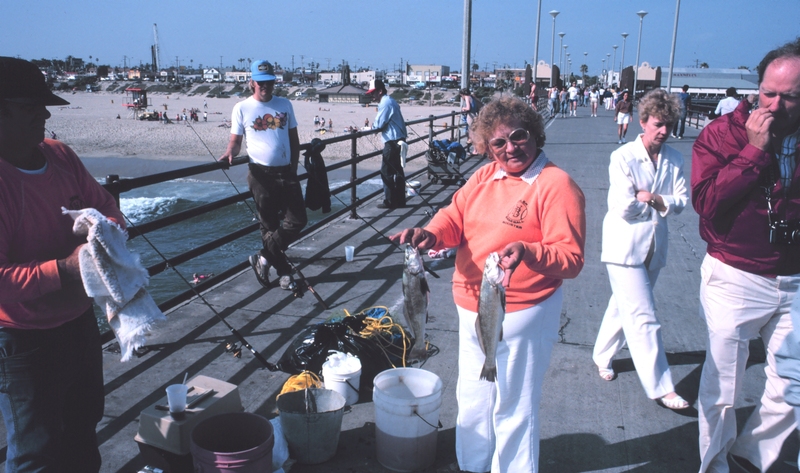 If seeking out the monsters, be sure to bring a treble-hook gaff, strong line, and a couple of strong friends to hoist your prize up to the pier.